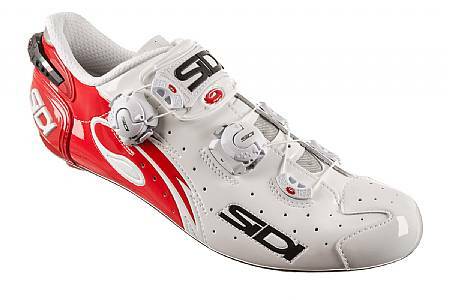 Ride with style and speed in high-quality cycling shoes from SIDI. At BikeTiresDirect.com, we're proud to offer the best prices available for the best cycling shoes on the market. Founded in 1960 by bike racer and shoemaker Dino Signori, SIDI quickly developed a reputation for functional innovation in the snow sports arena. When Signori shifted to making cycling shoes in 1973, they were a game-changing force: their shoe was the first on the market with adjustable cleat position, and the first cycling shoe to represent a real innovation in the industry in over 60 years. In 1979, SIDI introduced a nylon-soled cycling shoe—now standard across the industry. Over the next several decades, SIDI continued to deliver innovations and improvements to their shoes. In 1983, they introduced the first cycling shoe with Velcro straps for easy and secure adjustment. In 1985, they debuted the first dedicated mountain bike shoe. Many of their innovations have been in closure technology; SIDI's superb fit is a major reason why so many cyclists, both pros and discerning enthusiasts, choose them over and over again. SIDI's ratcheting adjustments allow cyclists to precisely control the fit of many of their shoes across the instep and even in the heel cup-totally eliminating heel lift and improving power transfer. All of SIDI's offerings, from high-end to entry-level, make use of SIDI's great fit technology and high-quality materials. It's true that even their lower-end shoes are relatively expensive, but it's important to keep in mind that cycling shoes are SIDI's whole reason for existing—they're not a larger shoe or cycling company trying to fill out their catalog. SIDI dedicates all of their energy and resources to understanding the biomechanics of pedaling feet and creating the best cycling shoes on the market to feet those feet—and the results speak for themselves. SIDI's high-end shoes feature performance-oriented details like full carbon fiber soles for lightweight stiffness, open/close-able venting for rider comfort in a wide range of conditions, micro-adjustable closure systems for a perfect custom fit, and adjustable heel retention systems to increase comfort as well as performance. And they're an investment that will last a long time-many parts are fully replaceable, so a worn-out heel pad won't spell the end of your shoe's life. Our selection of SIDI shoes includes options to suit pretty much any serious rider, whether you're a man or a woman, with wide feet, narrow feet, high insteps, narrow heels... whatever your quirk, SIDI has come up with a thoughtful solution to keep you comfortable on long rides and sprints, on the road or trail. We'd love to help you find the SIDI shoe for you; if you have any questions, please give us a call at 1-800-682-0570 or email us at [email protected].